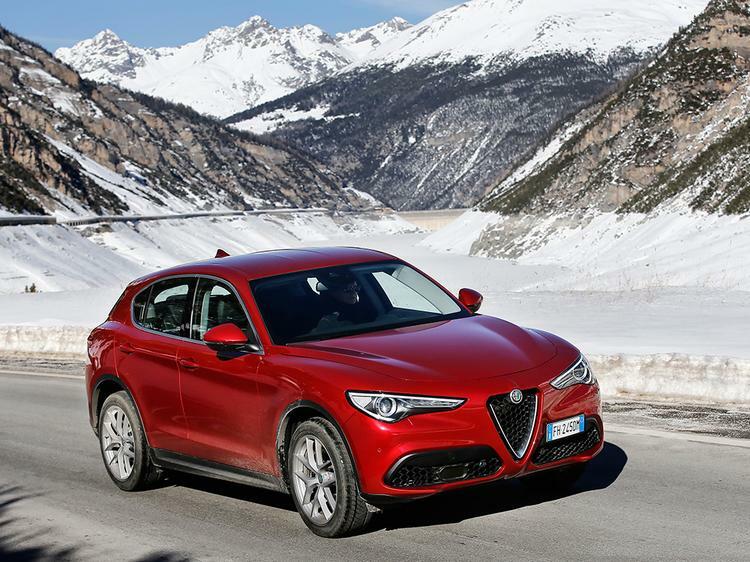 While PH types are probably most enthused about the Giulia (up to and including the Quadrifoglio), it's the Stelvio that's really key to Alfa Romeo's rebirth. Vital, you might say. Not only do the big premium manufacturers have many successful SUVs already - see BMW, Mercedes and Audi as the key examples - those that have previously ignored the market now find themselves compelled to compete. When Lamborghini feels the need to enter a market, albeit in its upper echelons, you sense the fad isn't going away anytime soon. There are two caveats to this review also. 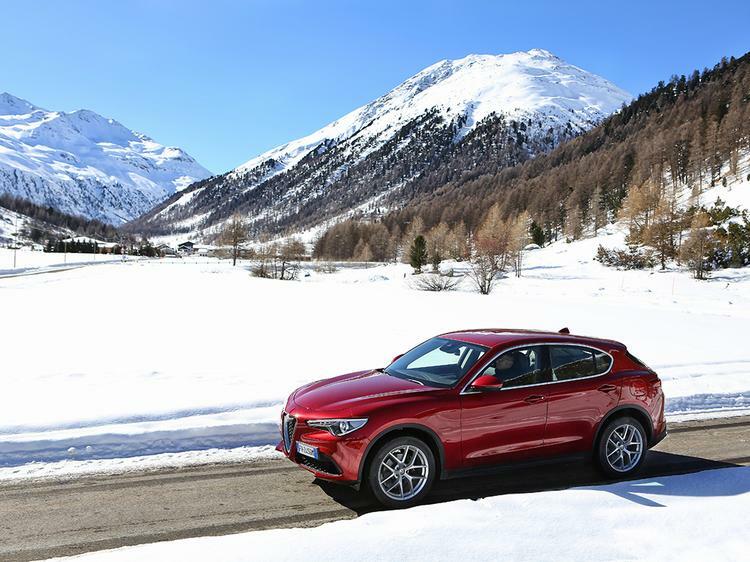 Firstly, the Stelvio wasn't driven on the Stelvio (it's closed due to snow) and there isn't a Quadrifoglio available yet; expect a drive in that later in the year. What's available instead are the two engine variants that will be on offer at UK launch in Q3 this year, the 210hp diesel and 280hp petrol. Both are all-new and all aluminium, both are paired to the ZF eight-speed auto with Alfa software and both, says Alfa Romeo, are "guaranteed to give even the most skilled driver unique thrills." By and large, the diesel is pretty good. It's decently refined, responsive from 1,500rpm (the auto won't kickdown if you've chosen the correct mode - a good sign) and strong through its mid-range. Predictably perhaps the upper reaches aren't really worth exploring, and it never feels as fast as that 0-62mph time would suggest (attribute that more to the short gear ratios), but it's a pleasant enough diesel. There are no nasty knocks or vibrations in the cabin, the automatic gearbox feels perfectly matched to it and it's subdued at a cruise. 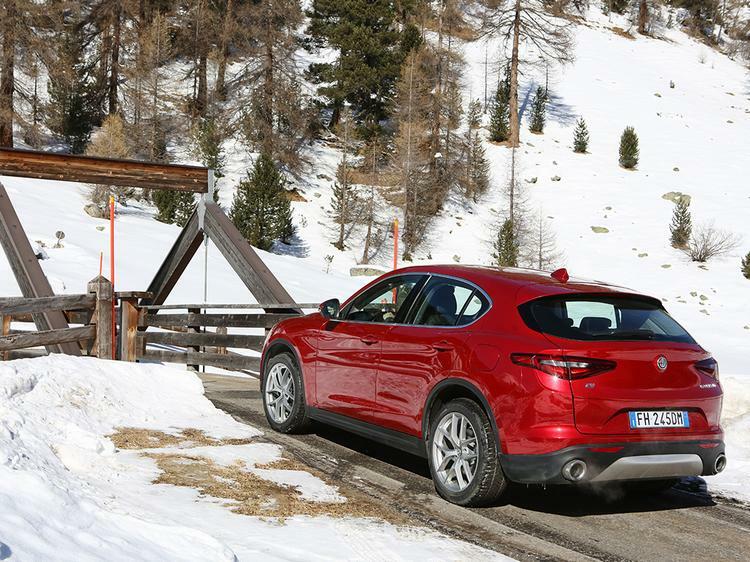 Perhaps the Stelvio diesel's biggest issue will be just how competitive the engine will feel against some very strong rivals; on this impression it feels to be on par for performance, while perhaps a little behind on refinement. Pleasingly though the Stelvio feels like it can take on all comers dynamically. Alfa makes great pains to stress the benefits of a low kerbweight (c. 1,650kg, achieved through some aluminium body panels and even a carbon propshaft) distributed evenly around the car and the sharp, direct steering with a 12:1 ratio. 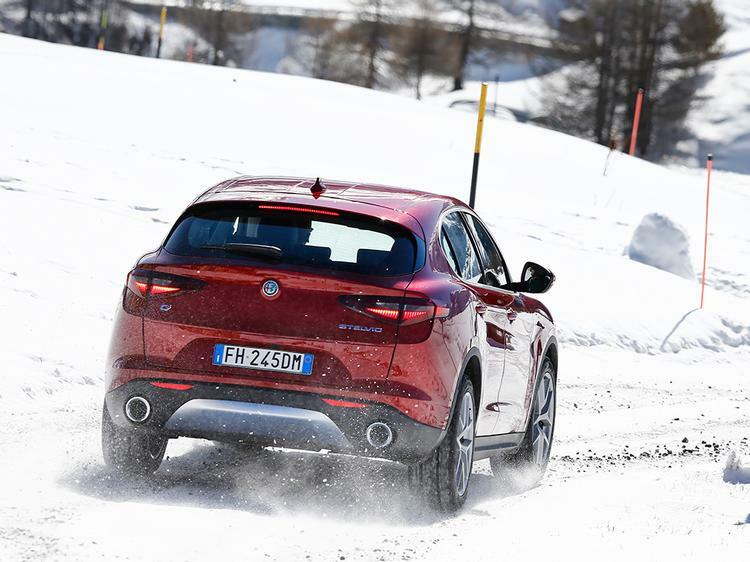 In the context of this event the work feels to have paid dividends, the Stelvio eager, willing and agile through bends, genuinely not feeling far off a good hatchback in terms of dynamics. On winter tyres it moves into understeer a tad sooner than is ideal (peak claimed cornering is 0.92g), but that's to be expected; more encouraging is that it doesn't feel like the interminable front-end push you might associate with a diesel 4x4, the car responsive to brake and throttle inputs to atone for your mistake. 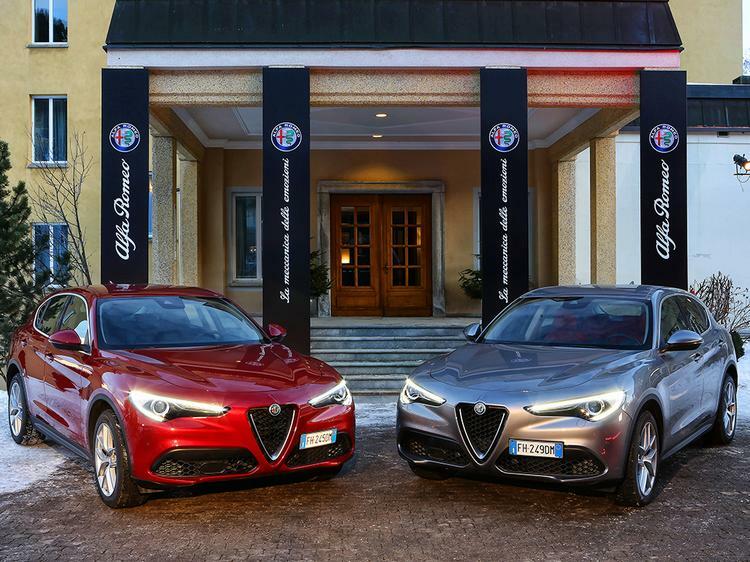 Alfa will tell you that its engineering approach is top-down with the Stelvio, that the lessons from the Quadrifoglio filtered down into the regular versions rather than the fast one being built from the humdrum cars, and there is a sense of that here. 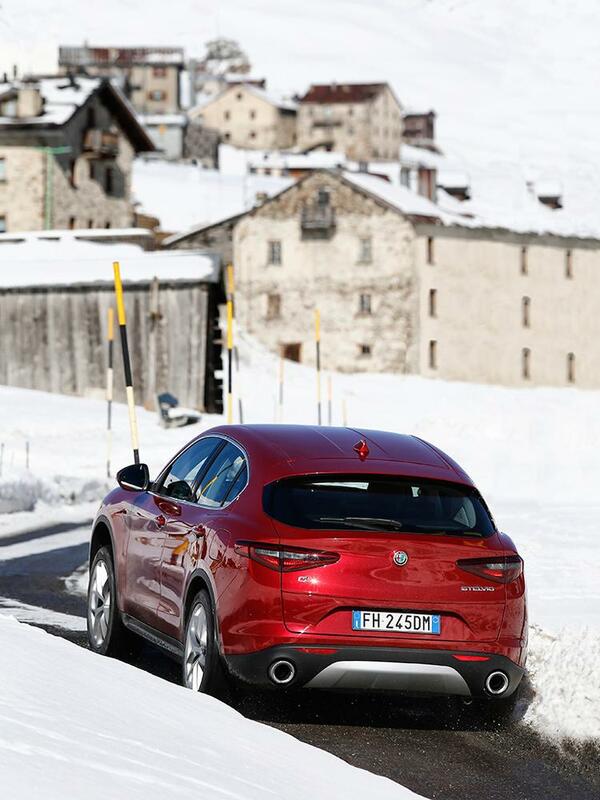 Without wishing to get caught in the 4C trap, here the Stelvio feels to handle with real ability and aplomb. 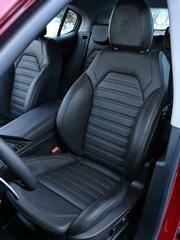 The brake pedal is fantastic, firm and confidence inspiring in a way that you again simply wouldn't credit an SUV with. Those big aluminium paddles are a joy to use - particularly as the slightly-too-aggressive gearbox map will change down a lot - and that steering is super direct yet not unsettling. In all honesty it feels ever so slightly Ferrari-like, the response initially a little unsettling but, having acclimatised, easy to get used to. A diesel SUV has never been quite this enjoyable on a mountain pass before. However, before this becomes a paean and we drop to pray to the Balocco gods, the Stelvio has a few of dynamic issues. A drag co-efficient of "less than 0.3Cd" promises much in terms of refinement, but on occasion a little too much wind noise can be heard. And while the ride is seemingly well damped, it could prove a little firm in the UK. That doesn't stop family buyers lapping up Macans though, does it? While mentioning the Porsche, it's clearly worth stating that definitive verdicts are impossible without comparison to the direct rivals. The signs are good though, put it that way. On all Stelvios the Chassis Domain Control allows the choice of Dynamic, Natural and Advanced Efficiency driving modes; the latter is best avoided, dulling the throttle response to an unacceptable level. Surprisingly though Dynamic is usually the best mode. Not only is the suspension uncorrupted (the new aluminium Alfalink setup is non-adjustable on these models), the additional steering weight is not unpleasant and the sharper throttle response welcome. 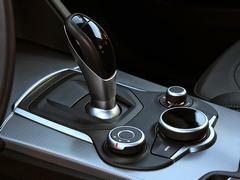 Gear changes are swift and smooth in all modes too, apart from that tendency in Dynamic to arrive at all corners in a gear not far off the redline. 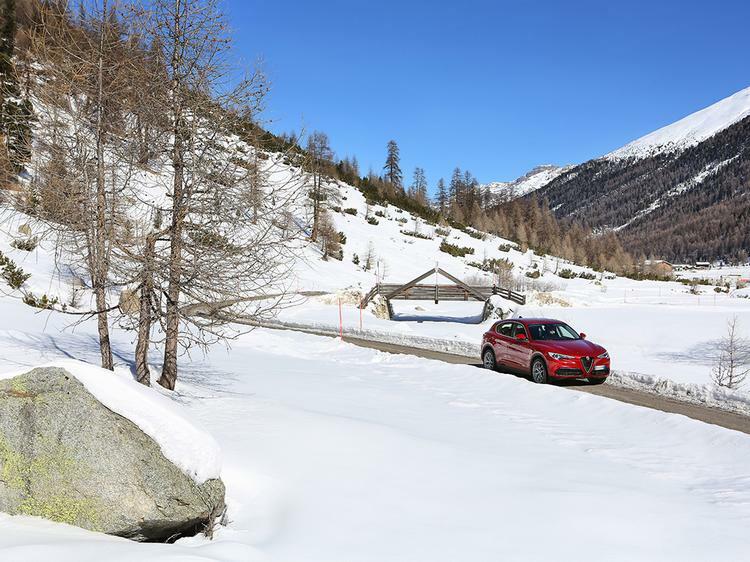 In normal conditions the Q4 all-wheel drive system is 100 per cent rear drive, with up to 50 per cent able to go forwards; without any slippery surfaces to test this on, there was little impression of power being directed around on this drive. 'Surefooted' is probably what you would call it. The petrol engine is again all aluminium and boasts some competitive numbers: 280hp is accompanied by 295lb ft which, combined with a 1,660kg kerbweight, means 0-62mph in 5.7 seconds, 143mph and 161g/km. In all honesty though it's a pretty flat engine - power and torque is plentiful, but there's no incentive to extend the engine; indeed with a rev limit at 6,000rpm the power band isn't a great deal wider than the diesel's. The noise is joyless too. 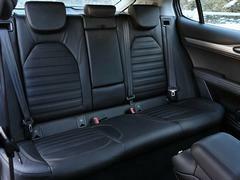 While fast enough, to have this sort of petrol engine from Alfa is rather disappointing. Still, the vast majority of UK buyers will be having the diesel anyway, so that's hardly the end of the world. Just a little sad. Of far more relevance (probably) to buyers will be the Stelvio's interior, where the car again feels to be broadly in line with the competition without ever surpassing it. It's spacious enough, refined enough, plush enough; at no point does it truly frustrate, though neither does the Stelvio inspire. The infotainment may be found to be lacking against rivals too, with some fairly plain graphics compared to cars like the Q5 and X3. The functionality is very good, though. 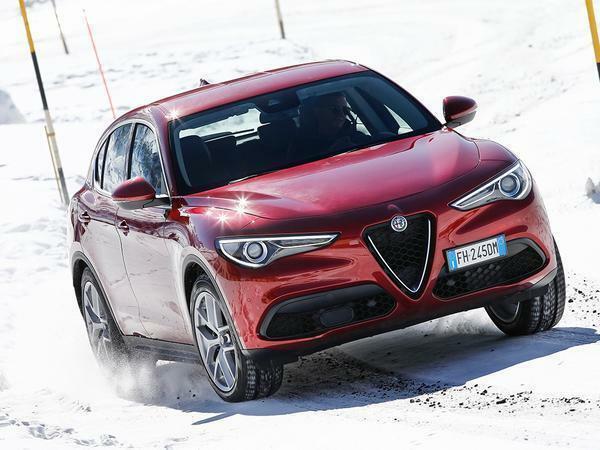 And while much is made of the Stelvio's driving position in comparison to the Giulia (apparently the roll axis is the same as the saloon), it doesn't quite envelope the driver like a Macan. Despite that there's plenty to recommend the Stelvio, of that there's no doubt, but the car enters into a fiercely contested segment. At the moment it feels on par (or very close) to cars like the Macan and F-Pace, with the GLC and X3 to bear in mind also. Whether some strong Alfa dynamics are enough to convince prospective buyers, particularly with the Porsche and Jaguar available too, remains to be seen; pricing will be a key factor as well, which is due in a couple of months. For now praise of the Stelvio is measured yet entirely warranted, the car feeling like a worthy sector entry rather than a new class leader. If you are an Alfa fan you'll find plenty to like here, though newcomers to the brand may need a little more convincing - let's see when it arrives in the UK in September. An acceptable alternative to the repugnant Bavarian Sierra brigade, and with Range Rovers now only purchased by sweaty stressed middle aged women, this could be a winner. 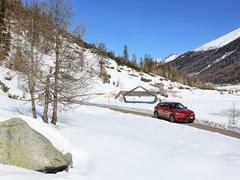 In normal conditions the Q4 all-wheel drive system is 100 per cent rear drive, with up to 50 per cent able to go forwards; without any slippery surfaces to test this on, there was little impression of power being directed around on this drive. 'Surefooted' is probably what you would call it. Woop, yet another ugly jacked up uncomfortable 4cyl diesel hatchback. I know they have to build one as the market gets what the market wants and it sounds like they've done the best job they could given the stupid requirements but why people want this sort of rubbish mystifies me. Because not every one is the same as you. It's quite simple.